If we were only $20.00 away from curing cancer, we would surely all clamor to be the one to complete the fundraising for the cure. Some of the ills of our society are that close to a cure. Ending the abuse of baby lions and tigers is one of them. In 2005 The Chronicles of Narniaâ€™s computer generated animation of Aslan the lion captivated the imagination of all who witnessed the fantasy. The notion of being so special that the creature known as the King of Beasts would allow us to touch him became irresistible to many when they were allowed to act out their fantasy. It only cost them $20.00â€¦ and their conscience. After paying $20.00 to have their picture made with a baby lion or tiger the vast majority of people, who learned the truth about the miserable lives captive cats lead, confess â€œI knew in my heart that there was something wrongâ€¦â€ Often it is the nagging conscience, reminding them of the distressed babyâ€™s cries for their real mothers, the barren accommodations, and the sleaziness of the business operators that haunted them long after the thrill of the moment had passed. Most of the â€œpay to playâ€ operations stay on the move. They set up in flea markets, fair grounds and parking lots for only a few days at a time. They frequently change their names and rarely own a facility anywhere that is open to public scrutiny. Then know that their pitch of doing this for education or conservation can easily be disproved. By the time they are found out, they are on the road again. In 2005 there were far too many lion and tiger babies bred just for this purpose and those who paid to touch them would be appalled if they knew how life has turned out for those innocent cubs. Big cats can breed several times a year, giving birth to 2-6 cubs. The cubs are immediately pulled and bottle raised so that the mothers can be bred again. It was not unusual to see a circus-type side show offering the public the chance to handle cubs who were only days old. To keep the cubs small they are often starved, and deprived of the calcium and vitamins needed to build big, healthy bodies. In some cases cubs have been purposely poisoned to give them diarrhea so that they cannot put on any weight. Pound for pound a big cat is 12 times stronger than a man, so keeping them small and handlable is the main objective for these abusers. When they get too big to use, they disappear and there is virtually no way to track them. If the dealer has 10 tigers this year and 10 tigers next year, then it appears as if no births and no disappearances have happened, so no further investigation takes place. It is no coincidence that the US is the second largest consumer of illegal, black market tiger parts. 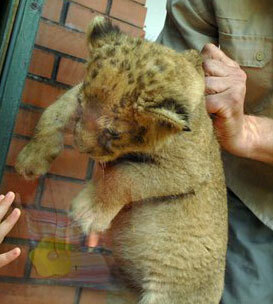 In 2007 USDA adopted a policy stating that baby big cats, under the age of 8 weeks and over the age of 16 weeks, could not be handled by the public. They also define a big cat as lions, tigers, jaguars, leopards, mountain lions, and cheetahs. Florida and some other states still classify a mountain lion as a small cat and allow them to be kept as pets, despite the fact that they can grow to be over 200 lbs and are very dangerous. (4) Does not allow any direct contact between the public and the prohibited wildlife species.â€ (prohibited wildlife species incl. lions, tigers, leopards, snow leopards, clouded leopards, jaguars, cougars and cheetahs). A lot can change in three years and there have been fewer and fewer news reports hawking the fun of touching a baby wild cat. Venues are becoming more aware of the public disdain for the practice and no longer want to be associated with what is now commonly viewed as cruelty. Every year there is a parade in Pinellas County, FL where a local man takes his tigers, bears and other exotic animals out in circus wagons as part of the spectacle. It has been a tradition that has gone from being accepted to being booed in just the last year. The operation owner and wildlife trapper, Vernon Yates was quoted in the St. Pete Times as saying, “I thought I would not see it in my lifetime but I think it’s coming — any form of private (exotic animal) ownership will be gone.” The public has become better informed and not only is refusing to support this abuse, but many people are coming forward to end it. Carole Baskin, Founder of Big Cat Rescue reports, â€œWe respond to every one of these complaints and urge the witness to take pictures, videos and written statements about what they saw to the USDA, to the state agencies that monitor wildlife, and to the media to expose the awful way these great cats are being treated.â€ They have been doing it and there has been a tremendous shift in the way people are thinking about and treating wild animals. When the next Aslan the lion movie, Prince Caspian, opened in theaters May 17, 2008 there did not appear to be even one baby lion or baby tiger photo booth advertised across the nation. â€œWe monitor the keywords: lion, tiger, cub, big cat and others via google news alerts and we closely monitor sites like www.911AnimalAbuse.com which is a site that allows people who have witnessed animal abuse to post a letter, photos and video while contacting USDA and the agencies mentioned above at the bottom of every page. We didnâ€™t see one report of a baby lion or baby tiger being used as a prop in conjunction with the opening of the movie,â€ says Carole Baskin. We are standing right on the edge of the societal shift toward being more compassionate. There is a bill before congress that will end the public contact with big cats and their babies and thousands upon thousands of people have written their lawmakers to support this bill to protect the babies from being bred, used and discarded as petting props. 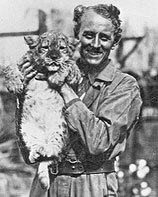 It is called Haleyâ€™s Act (HR 1947) and is named after a 17 year old girl who was mauled to death by a tiger while posing for a photo. You can write a letter in support of the new law at www.CatLaws.com You can end this kind of animal abuse in your lifetime. The cure is only $20.00 and a letter away. Donâ€™t pay to play with a baby big cat and write your Congress today! No user commented in " Dying To Be Held "